The shiny new Spicy Sichuan restaurant is bejewelled with brightly painted murals, block print wallpaper and a fairy lit entrance. Owned by Chang Dengyunn it has opened for business in an ambitious part of Glebe 20 minutes walk from Chinatown and surrounded by restaurants spanning Italian to Lebanese to Thai. The clientele are university students, big families and locals, piling in for cubes of puffed rice with sliced pork covered in an amazing hot vinegary sauce that snaps, crackles and pops when the two collide. Another favourite is mapo tofu – a fi ery dish splattered with minced pork and a judicious sprinkle of green onion. 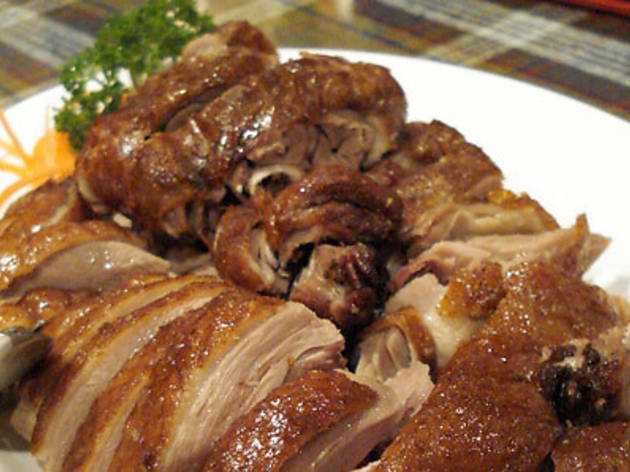 Though the fried maize pancake (studded with corn kernels and topped with tinned pineapple and peach) is tasty, the smoked duck can be smelt halfway across the room and earns highest marks. 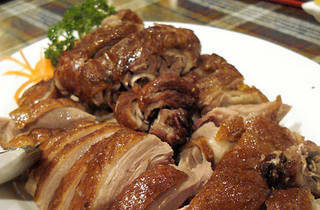 The meat served on the bone has a pungent ashen quality to it and the quack fat is crisp and golden. For the curious of palate, it’s hard to go past Tortoise plastron glue (yes, seriously) – a dish of black jelly-like cubes made from crushed tortoise shell mixed with sugar and Chinese medicine topped with (more) tinned fruit and a few squares of honeydew jelly. It’s a “dessert” but we’re not quite sure. Safer bets are dumplings in soup – glutinous, sticky white balls in a clear, sweet syrup. Glebe dining’s on the up and here’s more proof of it.